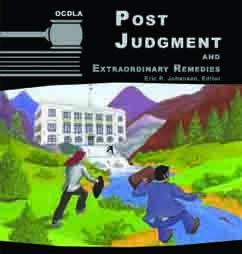 Now those extraordinary remedies you've tried to employ for your appellant clients just got easier with OCDLA's newest manual. Eric R. Johansen put together a blue-ribbon team of authors to produce this one-of-a-kind guide. The manual analyzes post-judgment proceedings, such as direct appeal and post-conviction proceedings, and proceedings that are not necessarily post-judgment, which seek extraordinary remedies such as mandamus in the Oregon Supreme Court, mandamus in the circuit courts, habeas corpus in the Oregon Supreme Court and habeas corpus in the circuit courts. The manual also analyzes statutes, constitutional provisions, administrative rules and significant case law. The enhanced PDF version is hyperlinked to cases, statutes, the Oregon Appellate Rules and more. It is thoroughly bookmarked for easy reference. A free digital version of the Preservation of Legal Issues guide is included. The hardcopy version comes with 16 colored mylar-reinforced tabs and a free laminated Preservation of Legal Issues guide. Armed with a boatload of practice tips and strategies for approaching these proceedings, you'll have a smoother time negotiating unfamiliar waters. Original cover artwork by Rich Jeffries.